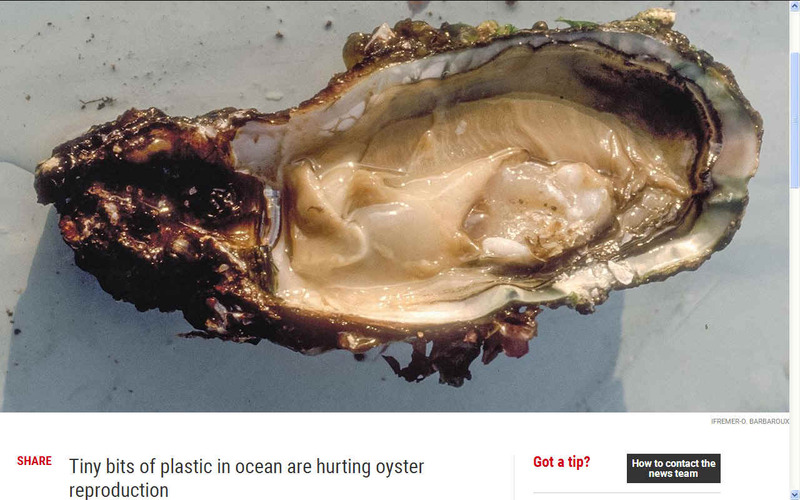 OYSTERS - Plastics are persistent synthetic polymers that accumulate as waste in the marine environment. Microplastic (MP) particles are derived from the breakdown of larger debris or can enter the environment as microscopic fragments. Because filter-feeder organisms ingest MP while feeding, they are likely to be impacted by MP pollution. To assess the impact of polystyrene microspheres (micro-PS) on the physiology of the Pacific oyster, adult oysters were experimentally exposed to virgin micro-PS (2 and 6 µm in diameter; 0.023 mg·L−1) for 2 mo during a reproductive cycle. Effects were investigated on ecophysiological parameters; cellular, transcriptomic, and proteomic responses; fecundity; and offspring development. Oysters preferentially ingested the 6-µm micro-PS over the 2-µm-diameter particles. Consumption of microalgae and absorption efficiency were significantly higher in exposed oysters, suggesting compensatory and physical effects on both digestive parameters. After 2 mo, exposed oysters had significant decreases in oocyte number (−38%), diameter (−5%), and sperm velocity (−23%). The D-larval yield and larval development of offspring derived from exposed parents decreased by 41% and 18%, respectively, compared with control offspring. Dynamic energy budget modeling, supported by transcriptomic profiles, suggested a significant shift of energy allocation from reproduction to structural growth, and elevated maintenance costs in exposed oysters, which is thought to be caused by interference with energy uptake. Molecular signatures of endocrine disruption were also revealed, but no endocrine disruptors were found in the biological samples. This study provides evidence that micro-PS cause feeding modifications and reproductive disruption in oysters, with significant impacts on offspring. In an effort to feed a growing population we should look at alternatives lower down the food chain to increase the ratio at which protein is harvested from the ocean, so bypassing the conventional food chain where at each stage of consumption there are significant losses in the conversion process. Oysters could play a part in filling the widening gap between falling fish stocks such as tuna, and higher demand to feed humans. Unfortunately, filter feeders cannot escape waste that humans flush into the oceans, having no choice but to live in the pollution that humans create, including pharmaceuticals. The effects of these medications, including cocaine, are not yet fully understood. Obviously, we need to keep an eye on this phenomenon. Eating, for an oyster, is pretty simple: Take water in, keep the tasty plankton, and spit water out. Increasingly, however, these mollusks are exposed to tiny pieces of plastic the same size as oysters’ preferred plankton meals. 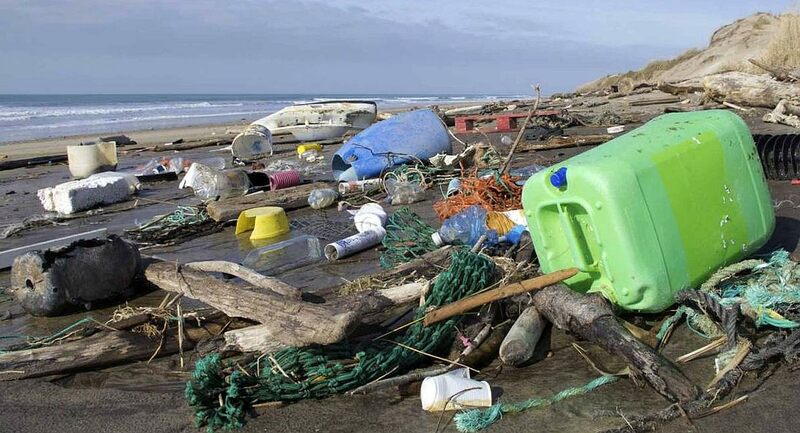 More plastic from various products and industrial processes ends up in the oceans each year, and over time, this waste breaks down into smaller and smaller pieces. In a study published online today in the Proceedings of the National Academy of Sciences, researchers show that when Pacific oysters (shown) are exposed to so-called microplastics in the lab, they ingest a large proportion: 69% of the 6-micrometer particles added to the water. These end up in the oysters’ guts and make the animals invest less energy in reproduction, either by disrupting their digestion or their hormone systems. Female oysters exposed to microplastics made 38% fewer eggs, and males made sperm that were 23% slower. Plus, they had fewer offspring, which were themselves slower to reach maturity. This could create difficulties for aquaculture—Pacific oysters are grown for food around the world, and other filter feeder favorites such as mussels and sea cucumbers may be similarly affected. DELICIOUS PLATTER - If we want to continue to enjoy healthy ocean harvests, we must take a leaf from the oyster's book and filter the oceans of harmful marine plastic. When waste plastics – like polystyrene – find their way into bodies of water, they degrade into microscopic particles known as microplastics. These tiny particles range from about 2-6 micrometers in width, which is up to about 0.0002 inch, or less than a fifth of the width of a human hair. Industrial processes, clothing and waste plastic, and cosmetics in sewer water all contribute to a massive influx of the plastic particles into lakes and oceans. A particular concern is whether filter feeding aquatic life – such as as clams, oysters, barnacles, corals, sea squirts, and sponges – will be harmed from ingesting these plastics. Few studies have shown a direct effects on marine animals, but now a new study, published in the Proceedings of the National Academy of Sciences, does find a negative impact from plastics on the reproductive health of oysters. Rossana Sussarellu and colleagues from France and Belgium performed some simple yet effective experiments to the role of plastics on the eating and reproductive behavior of these filter feeders. The experiments consisted of raising oysters in the lab with simulated ocean water, with and without microplastics. One finding was that the oysters exposed to the plastics ate more microalgae than the control group. The authors speculate that this was to compensate for the negative impact plastics had on energy uptake by the oysters. Essentially, they had to eat more to get the same amount of energy. There was also a shift in how oysters spent their energy uptake, shifting it away from reproductive development to structural growth. This was manifest in female oysters producing 38% fewer oocytes (eggs) and male oyster sperm velocity declining 23%. Overall, the production of larvae in oysters exposed to these plastics was 41% lower than the control animals. 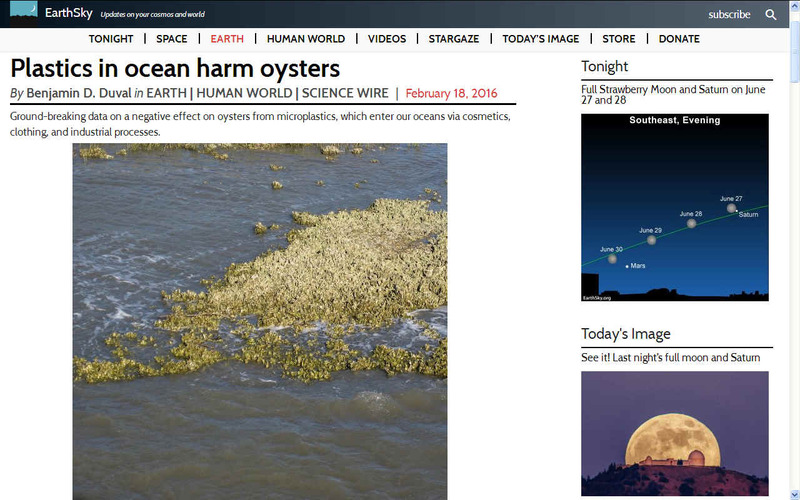 Perhaps most troubling about these results is that the lab-grown oysters were only exposed to plastic concentrations of 0.01 milligrams of microplastics per liter of water, which is far lower than the 0.8 to 2,500 milligrams plastic per liter exposure reported in the wild for other marine invertebrates in contaminated waters. Oyster is the common name for a number of different families of salt-water bivalve molluscs that live in marine or brackish habitats. In some species the valves are highly calcified, and many are somewhat irregular in shape. Many, but not all, oysters are in the superfamily Ostreoidea. Some kinds of oysters are commonly consumed by humans, cooked or raw, and are regarded as a delicacy. Some kinds of pearl oysters are harvested for the pearl produced within the mantle. Windowpane oysters are harvested for their translucent shells, which are used to make various kinds of decorative objects. Bivalves, including oysters, are effective filter feeders and can have large effects on the water columns in which they occur. As filter feeders, oysters remove plankton and organic particles from the water column. Multiple studies have shown individual oysters are capable of filtering up to 50 gallons of water per day, and thus oyster reefs can significantly improve water quality and clarity. As an ecosystem engineer oysters provide "supporting" ecosystem services, along with "provisioning", "regulating" and "cultural" services. Oysters influence nutrient cycling, water filtration, habitat structure, biodiversity, and food web dynamics. Oyster feeding and nutrient cycling activities could "rebalance" shallow, coastal ecosystems if restoration of historic populations could be achieved. Furthermore, assimilation of nitrogen and phosphorus into shellfish tissues provides an opportunity to remove these nutrients from the environment, but this benefit has only recently been recognized. AQUACULTURE - Farming oysters will not change the fact that plastic in the ocean will still be ingested by these and other filter feeders. Oysters are harvested by simply gathering them from their beds. In very shallow waters, they can be gathered by hand or with small rakes. In somewhat deeper water, long-handled rakes or oyster tongs are used to reach the beds. Patent tongs can be lowered on a line to reach beds that are too deep to reach directly. In all cases, the task is the same: the oysterman scrapes oysters into a pile, and then scoops them up with the rake or tongs. In some areas, a scallop dredge is used. This is a toothed bar attached to a chain bag. The dredge is towed through an oyster bed by a boat, picking up the oysters in its path. While dredges collect oysters more quickly, they heavily damage the beds, and their use is highly restricted. Until 1965, Maryland limited dredging to sailboats, and even since then motor boats can be used only on certain days of the week. These regulations prompted the development of specialized sailboats (the bugeye and later the skipjack) for dredging. Similar laws were enacted in Connecticut before World War I and lasted until 1969. 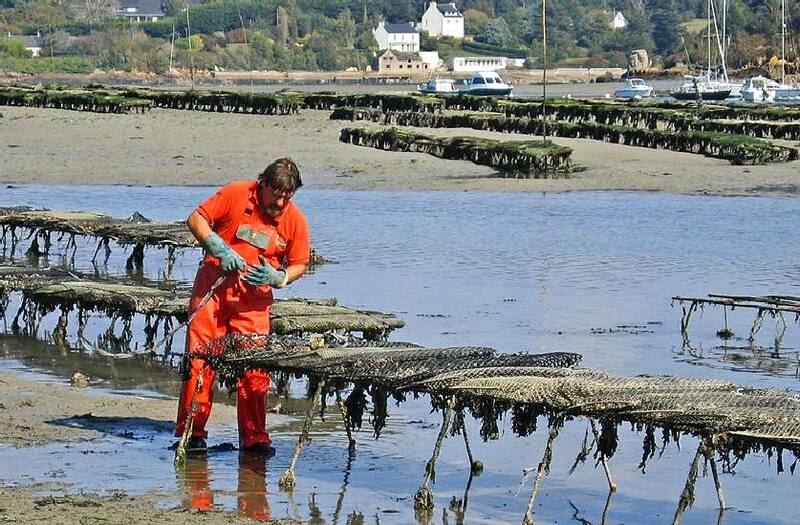 The laws restricted the harvesting of oysters in state-owned beds to vessels under sail. These laws prompted the construction of the oyster sloop-style vessel to last well into the 20th century. Hope is believed to be the last-built Connecticut oyster sloop, completed in 1948. Oysters can also be collected by divers. In any case, when the oysters are collected, they are sorted to eliminate dead animals, bycatch (unwanted catch), and debris. Then they are taken to market, where they are either canned or sold live. Oysters have been cultured since at least the days of the Roman Empire. The Pacific oyster (Magallana gigas) is presently the most widely grown bivalve around the world. Two methods are commonly used, release and bagging. In both cases, oysters are cultivated onshore to the size of spat, when they can attach themselves to a substrate. They may be allowed to mature further to form 'seed oysters'. In either case, they are then placed in the water to mature. The release technique involves distributing the spat throughout existing oyster beds, allowing them to mature naturally to be collected like wild oysters. Bagging has the cultivator putting spat in racks or bags and keeping them above the bottom. Harvesting involves simply lifting the bags or rack to the surface and removing the mature oysters. The latter method prevents losses to some predators, but is more expensive. The Pacific oyster has been grown in the outflow of mariculture ponds. When fish or prawns are grown in ponds, it takes typically 10 kg (22 lb) of feed to produce 1 kg (2.2 lb) of product (dry-dry basis). The other 9 kg (20 lb) goes into the pond and after mineralization, provides food for phytoplankton, which in turn feeds the oyster. To prevent spawning, sterile oysters are now cultured by crossbreeding tetraploid and diploid oysters. The resulting triploid oyster cannot propagate, which prevents introduced oysters from spreading into unwanted habitats. MARINE LIFE - Humans are for the most part unaware of the harm their fast-lane lifestyles are causing. We aim to change that by doing all we can to promote ocean literacy. This includes spreading the news about foods that are good for us and good for the ocean economy.